“It is an event which relies on community spirit and at the same time brings a sense of togetherness by its success,” he said. A record $61, 357 was raised during the Annual Outrigger Walk for Kids 2019 charity event in Sigatoka yesterday. 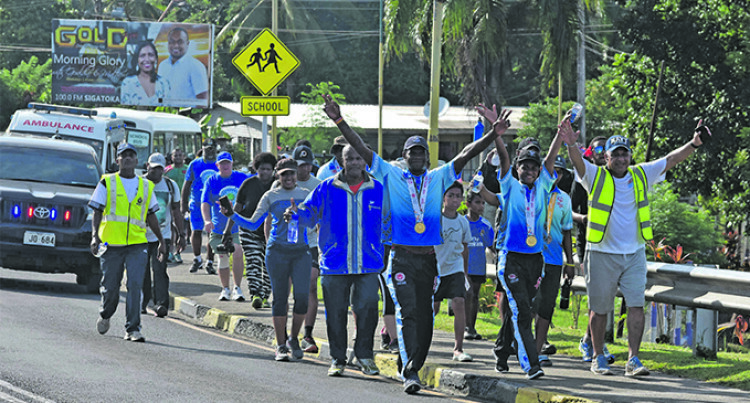 Outrigger Fiji Beach Resort general manager Russell Blaik said they celebrated the fifth staging of the Outrigger Walk for Kids to raise funds for education and cater for children with special needs. The event was initiated by the resort in 2015 as a means of raising funds to help support the education and care for children with special needs in Nadroga Navosa province including Sigatoka Special School. “These achievements are the hard evidence of what our sense of oneness and giving can deliver to those in need in our wider Fijian family,” Mr Blaik said. This year’s project is to build a floodwater retention wall and fence for the school as well as fund other development programmes throughout the year. There are also plans to extend assistance to selected rural schools beginning with the construction of a students’ bus shelter at Nalagi Primary School and construction of new toilet facilities in Conua District School. Mr Blaik added Outrigger Fiji Beach Resort relied on the support of its guests, hosts, corporate partners and Fijian Government for the success of this annual event. “It is gratifying to see that as in the past, this support has been forthcoming,” he said. Sigatoka Special School head teacher Asenaca Sukanatabua said the education of our children was one pillar on which we would create the Fiji of tomorrow. “It is vitally important that children with special needs be part of our nation building,” Ms Sukanatabua said. The institution opened its door for the first time in June 22, 1985 and today has total school roll of 67 children. She thanked the resort’s sales and reservation director Petero Manufolau and his team for their ongoing commitment.